Stacy Yates Nutrition: Project "Suprise"
Last night was a better night for us over here, although my daughter still woke up twice to pee. We'll discuss evening potty breaks for kids later. Every time my husband leaves for work on a conference (where I have a good couple days to "work") I inevitably do something major to the house. I disguise unplanned purchases (completely decided upon by myself) as surprises for him. He's fairly easy going that way, so lucky for me I continue to get away with it. 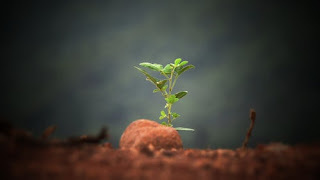 Sometimes the projects are large, sometimes they are small. One time I moved my daughter and I out of the house for a couple days while I had the entire house painted. That was a real fun one! This one won't be quite as extreme - but has still taken me some time to prepare. I hope he likes it. And if he doesn't - at least I will! That's the beauty - You don't need to confer or agree on anything! ;) In any case, this is why I have been busy. I'll share the details with you later, and if I am organized enough, maybe even provide some before and afters. 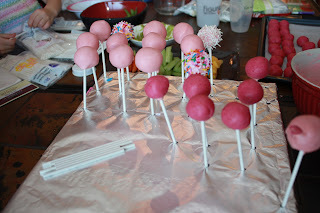 Over this past weekend my sisters and I got together to make some cake pops. We wanted to make some Halloween ones, and try some regular ones. 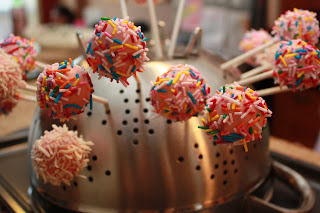 Being the overambitious individual that I am, for our first try, I suggested four types of cake pops. By the end, we were all exhausted and had been able to do some experimentation for next go round. One day soon I will share that with you (likely when we plan our next cake pop date) but for now, I'll just post some photos. 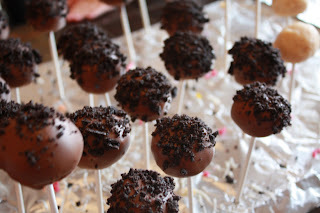 I should also note that http://www.bakerella.com/ has some great ideas on her website, and recipes for cake pops. "is that an upside down colander"? you ask...."why yes it is". 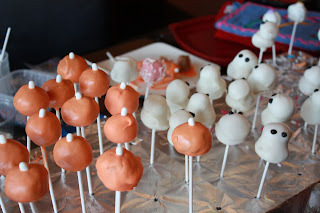 Pumpkins weren't a huge success but we were quite happy with our little ghosts! curious what you are up too ;-). 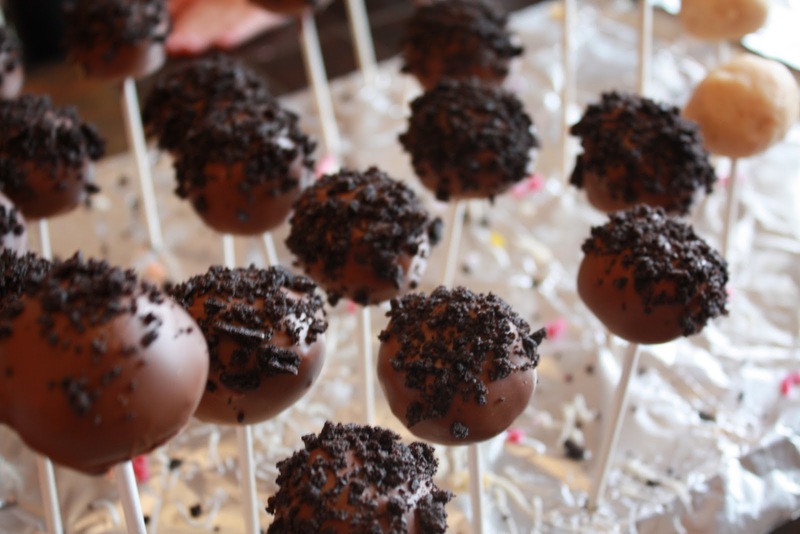 Those cake pops turned out great!